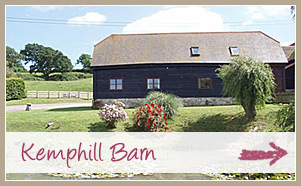 Kemphill has two, 5 star, gold award, self catering barns available for your holidays on the Isle of Wight. Both are fully en-suite and come with WiFi. 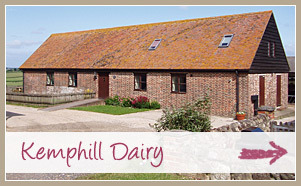 The Old Dairy sleeps 12 in 5 en-suite bedrooms and The Barn 10 in 4. The Dairy has all zip/link beds enabling up to 12 single beds if required. The Barn is more conventional with one zip/link, two doubles and 4 singles. The barns are on the top of a hill overlooking 200 acres of rolling pasture and 50 acres of forestry. For 7 months of the year 200 beef cattle graze the fields. In winter help us feed them in the various buildings at the farmstead. The 50 acres of forestry offer stunning walks at any time of the year. If you are very quiet you should see a red squirrel! Now halfway into a fully sustainable 10 year management plan, the woodland provides the fuel for the biomass heating system used by all the properties. I have never seen any better farm accommodation in the UK.